How safe is that chemical? Professor Jen Maki, Ph.D., is playing a key role in a research effort that will help scientists at the Environmental Protection Agency determine how certain chemicals affect living things and regulate them accordingly. Her work will not only strengthen efforts to address pollution nationwide, but will benefit her students in St. Scholastica's labs. "I'm excited to bring a collaboration with the EPA to the upper division biochemistry course," Maki said. "This partnership will increase the number of our students participating in a research project, something I'm very passionate about." Maki took a yearlong sabbatical from her role as an Associate Chemistry Professor and Chemistry Department Chair to lend her expertise to EPA research efforts at the Mid-Continent Ecology Division Laboratory in Duluth. Scientists there develop ways to measure the toxicity of various chemicals and their potential impact on living things. The research helps guide the EPA's decision-making process concerning the regulation of tens of thousands of chemicals used across The U.S. every year. This is no small task, as the vast majority of existing and new compounds haven't been subjected to comprehensive toxicity testing. The EPA's Chemical Safety for Sustainability Research Program is leading the effort to innovate chemical safety evaluation. Much of the Duluth EPA lab's work focuses on endocrine disruptors, chemicals that can cause hormonal problems in animals and humans. The compounds can interfere with biological processes such as development and maturation, possibly resulting in deformities, tumors or other negative effects. She collaborated with research scientists Gary Ankley and Dan Villeneuve on projects that improve the science community's understanding of endocrine signaling. Ankley and Villeneuve have developed tools called adverse outcome pathways (AOPs), diagrams that illustrate, step by step, how chemicals cause adverse effects for animals. AOPs provide a consistent, efficient, cost-effective way for scientists to draw larger and more meaningful conclusions from their research. As more AOPs are developed, the scientific community will have greater confidence in the prediction of the biological effects of various chemicals. During her project, Maki used AOPs to inform her research. Maki's research focused on the use of CRISPR/Cas9, a genome-editing technology that allows researchers to modify genes to study their purpose in the organism. 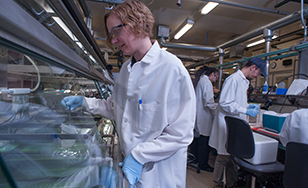 She used the method to disrupt a single gene target in fathead minnow, a regionally important fish that has been used in regulatory aquatic toxicity testing for decades. It gave her a chance to utilize a cutting-edge research technique. "CRISPR/Cas9 genome editing technology was named Science Magazine's 2015 Breakthrough of the Year; it's an inexpensive and dependable way to disrupt a specific gene in any organism by an enzymatic strategy borrowed from the bacterial immune system," Maki said. She and her colleague, Jenna Cavallin, developed and tested a method for CRISPR/Cas9-based gene disruption in the fathead minnow. This was accomplished by first studying a target gene for which mutation was easily observable through pigmentation differences of the minnow's body and eyes, with some of the experimental fish completely lacking color. Now that this method has been established, Maki said, it opens up a wide range of possibilities for future study. "We are positioned to assess individual gene function for any gene of interest, a situation particularly valuable for the validation and development of AOPs," Maki said. "The use of this gene disruption system at the EPA will produce results while requiring fewer chemicals and fish, saving money in the process." Her colleagues at the EPA are very appreciative of her research efforts. "A challenge we face when bringing a new technology such as CRISPR into our research portfolio is identifying top-notch scientists with the necessary background and experience to tackle what can, at times, be daunting tasks," Ankley said. "Jen has succeeded in this effort beyond all expectations, making a contribution that will have a significant impact in the field of predictive ecotoxicology." Maki concluded her partnership with the EPA and wrapped up her sabbatical at the end of June, and will return to the St. Scholastica classroom this fall. She'll work with biochemistry II students to continue the work she started at the EPA. Besides benefiting her students, she said, "the collaboration will also benefit the EPA by accelerating the pace of AOP validation through engagement of the undergraduates in the project."